I've heard from several different ‪#‎gastroparesis‬ groups and pages that there are different levels of "sickness." I want to reiterate that ‪GASTROPARESIS‬ IS NOT A COMPETITION, nor are any other invisible and chronic illnesses! 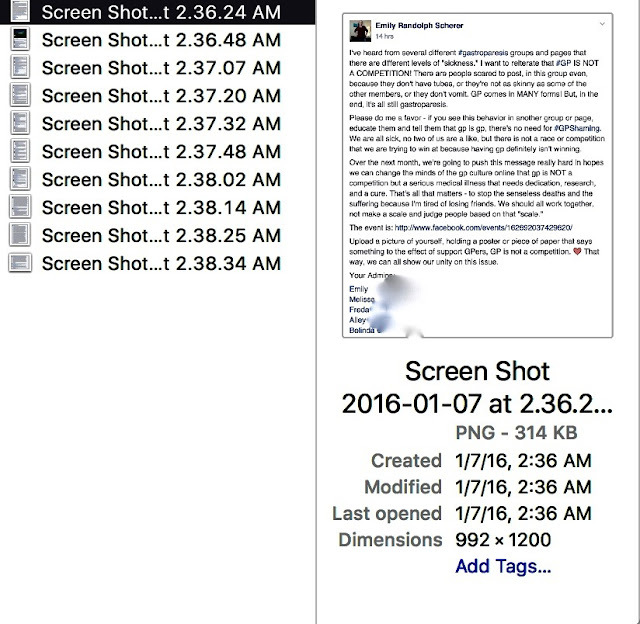 There are people scared to post, in my gastroparesis groups even, because they do not have tubes, or they are not as skinny as some of the other members, or they do not vomit, because these people are scared they are not sick enough to post. Gastroparesis comes in MANY forms! But, in the end, it's all still gastroparesis. It's still a debilitating illness, one that we are striving to bring awareness to, to get research for, so that hopefully, we can find a cure. We cannot keep losing loved ones to this illness. I just lost one of my close gastroparesis friends right before Christmas. I want to make sure that her death was not in vain and neither were her awareness posts and activities. "a group of people who meet regularly to support or sustain each other by discussing problems affecting them in common, as alcoholism or bereavement." "When I first learned about gastroparesis it was from a friend active in the community. Once I began to understand the impact that GP had on a person's life, and the lives of those around them, I knew I had to participate somehow in advocacy. I started joining groups, reading posts, and becoming as intimately familiar as someone without the disease can become. But I started to sense tension. Group A, B, C, D weren't WORKING TOGETHER. In fact it seemed like there was strife between the groups. I'm a grown up, I know how things work, I understood there would be fractures, but I believed (and still do) that the best way for the GP community to get the care and attention it NEEDS is for all the groups to lay down their arms and work together. How is that to happen? I'm hoping someone smarter than me can figure it out but I have a few ideas. Bless us all and may 2016 find us overcoming many of the obstacles that GP presents to it's sufferers. Thank you Emily for building bridges." Support groups fighting with other support groups needs to stop as well. We all need each other and we are all on the SAME TEAM! I can't stress that enough. It's not a competition for numbers, for who is sickest, for who has had the most procedures - it's a support group for SUPPORT! We need to make sure to take care of our own because GPers (gastroparesis patients) are the only ones who really understand what GPers go through on a daily basis because we live through it and we need to band together to help others realize this is a real illness, even though it's invisible, and stop fighting with each other to fight the much bigger fight of spreading awareness and having others take us seriously, not to mention helping others who have been newly diagnosed that do not know where to even begin! How can they take us seriously when we can't even align ourselves, all of the gastroparesis Facebook groups and pages, to unite for a common goal? If you think doctors and nurses don't join the gastroparesis support groups to try to learn more about the disease, then you would be wrong. Instead, they see all of backbiting, talking badly about other groups/people, and plans on how to get more members without addressing the concerns of members you already have - I mean, it happens. I chose to stay offline for a while because I felt like support groups were doing me more harm than good. The extra unnecessary drama was making me a lot more ill. But, I'm back because not all of the support groups are like that and I'm lucky to have found them. I am going to take a stand, but I need YOUR help. I can't do this alone. It's going to take all of us working together to get rid of this stigma that has risen in "support" groups lately. So, as a result of that, I am making an event that will last for a month. The point of this event is to stop #GPShaming, bullying, number's games in support groups, and to get rid of any type of competition. I want to weed out the toxic groups so that people can find the love and support they need in order to live with this illness, because gastroparesis is hard enough and no one should have to deal with it alone. Please invite them to join this event. Please don't let #GPShaming (please use this hashtag when talking about this event or when you post a photo for unification) happen in your group, or bullying, or anything that can be harmful to other groups. Support groups should be about support and not a popularity contest...it shouldn't look down on anyone who is having a bad GP day or who needs help. There shouldn't be judgements, just acceptance. I want to rid the groups of this stigma. I also want all of the GP support groups and pages to work together on this event - because we should be uniting to help spread awareness, education that leads to research, so that we can find a cure for this illness, our illness. Over the next month, we're going to push this message really hard in hopes we can change the minds of the gastroparesis culture online that gastroparesis is NOT a competition but a serious medical illness that needs dedication, research, and a cure. That's all that matters - to stop the senseless deaths and the suffering because I'm tired of losing friends. We should all work together, not make a scale and judge people based on that "scale." The support groups should NOT be at war with each other, there is no point in fighting with one another - we hurt each other and others. People who have been recently diagnosed who come to a support group for advice and help become collateral damage, and that's NOT OK. This is in regards to Facebook Groups but seeing how some of this is done in some of these groups is almost like corporate espionage with how elaborate it is to tear a part other groups and take their members. People can join multiple support groups and we encourage that. But, mudslinging from different groups and having competitions on who can get the most members is silly and is missing the point of what a support group is here for. We want all of the Gastroparesis Support Groups to work together to do this...because we all need to support each other too. Upload a picture of yourself to the wall, holding a poster or piece of paper that says something to the effect of GP Support Groups support each other and GP is not a competition. ♥ That way, we can all show our unity on this issue. Again, let me reiterate, people in support groups are in there for SUPPORT. That means supporting that person in the decisions they make, WITHOUT JUDGEMENTS, and to offer advice and guidance for those who are new to this illness. It is NOT a place to start a who is sicker than who competition. Who cares? We're all sick. Does it matter who has what or who is sicker than who? No, it doesn't. We should all be working together, not judging each other and making others feel stressed because that makes the person sicker and lowers their immune systems. This in support group fighting thing is ridiculous. It makes me angry. We should all be working towards a common goal. However, just like life, not everyone gets along. Also, there are different topics, different support groups to help people find the support group that is the right fit for them. Every GPer is different. You can't take all of the gastroparesis group members and put them in one big group - because everyone has different needs. They have the right to choose a group that works for them, personally, or make a group that works for them and other people. One of my friends told me tonight that she's tired of the "fracturing" of support groups. I cannot help with that, it is beyond my control. I have the groups I have - different topics, to help people. But, like I said, every GPer is different and they have different needs, different ways of coping, and they deserve to join a group that works for them and helps them through it. I do work with other group owners and send people their way when they ask certain questions I can't answer, and I point them to the group that would maybe answer their questions and give them better advice. I do my best to send people to already established groups about their particular issues. People can be a part of multiple groups. You don't have to leave one you like for another one you like. That's silly. I just want to help people. As for fracturing, that's beyond my control. I can't control what other people do and I understand we should all be working towards a common goal, but sadly, it's not a perfect world where everyone gets along so we can do that. But, I do try to work with other group owners and I do my best in my groups. I don't want people judging each other in there because you never know what a person is going through, you would have to, what's the saying? Walk a mile in that person's shoes to understand. People rush to judge without having all of the facts and that's not right. It's also not right to make it so that people are scared to post in support groups because they don't want to be attacked. That bothers me in groups as well. 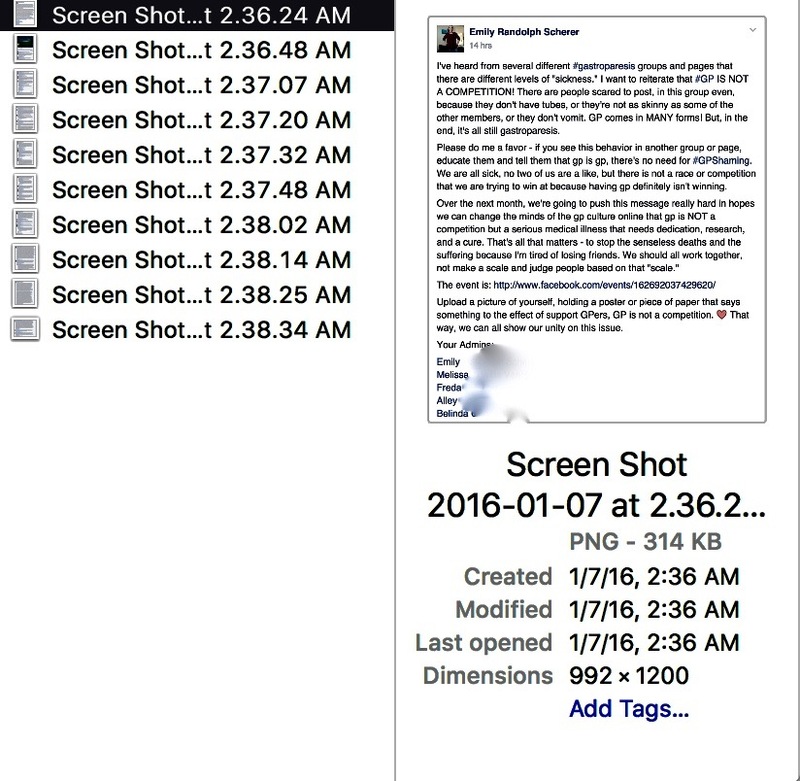 No one should be scared to post. They need to be able to express themselves without retribution. The support group may be the only place they can vent, and instead, they keep things bottled up and get sicker because they are too scared to post. That is NOT OK! I'm working so hard in my groups to make sure that doesn't happen. It seems like the support groups have lost the meaning of support. Support groups are also not a number's game, period. It does not matter how many people you have in a support group. That is NOT the purpose of having a group in a community for the chronically ill. I will say that I am tired of the bullying, backbiting, and everything else going on in the groups today. There is a lot of cyber bullying in groups today which make individuals scared to post questions. If they post a question someone else does not like, they do not scroll past, but instead they start an argument and bully the person. 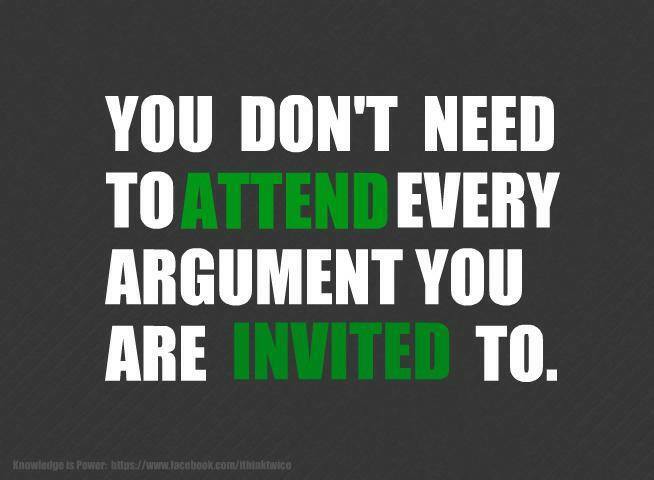 The argument is not constructive and it is not civil. It's sad when people have to tear others down to make themselves feel important and relevant and it has been happening SO much lately. 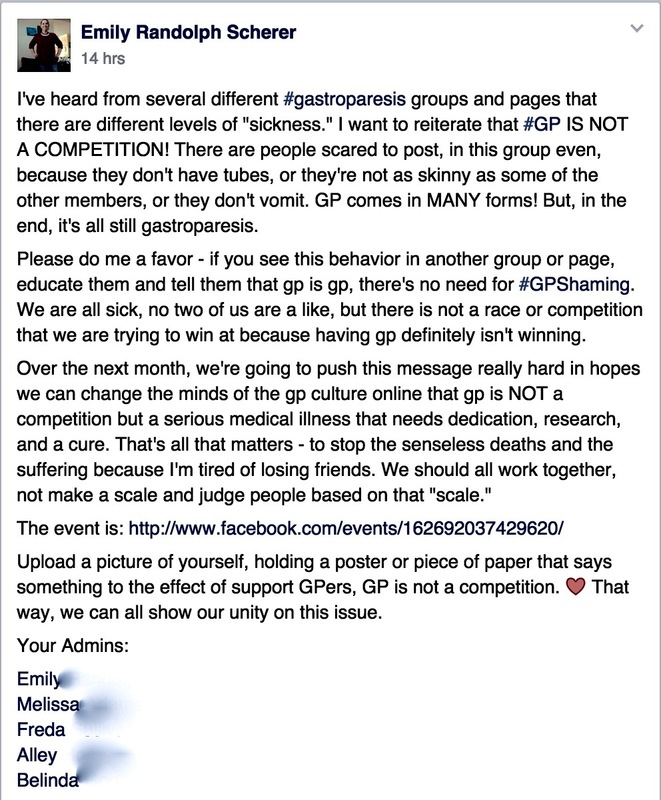 Because of people like this, the Gastroparesis community cannot come together, and work together towards a common goal. I am not sure where the toxicity came from that has invaded the gastroparesis community, but we all need to work together to address the issues and fix it. In the beginning, in about 2011, a handful of my friends and I started support groups for the community. We were a close knit group - but now, it seems like everything is fractured. There are cliques, people who want attention, people who bully others, power trips, and so many more toxic things that were not always there. There is so much drama now. There are also so many duplicated groups that it's a bit daunting. 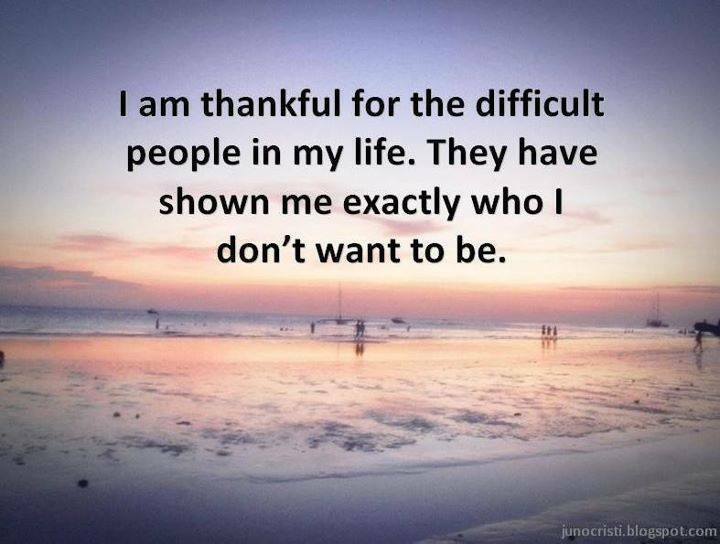 We will not be able to unite until we get rid of the toxic people in the community who only hurt us, not lift us up. There are some really toxic people, almost like emotional vampires, staking out the groups and ready to pounce. They will disguise themselves as your friends, but you really have to be careful who you let into your life - especially someone you do not really know well that you met on the Internet. But, I digress. We need to do some spring cleaning in our gastroparesis community. And that's the point of this article, we are already so sick, we need to lift each other up and to help, look out for one another. So, if there is a story floating around about someone, I do not jump to the conclusion that it is true. I do not judge the person who is the subject of rumor and gossip. I do not believe everything I hear. Instead, I question it. There are always two sides to every story, whether people want to hear them or not. Likewise, if I see a post or comment in the groups that I do not like or with which I disagree, I ignore it and scroll on by, or hide the posts. Everyone is different. They come from all walks of life and should be treated with respect in the support groups. Most of these people are isolated because of their chronic illness, so their only contact with the outside world is through the Internet. Also, their gastroparesis is no less than mine, it does not matter if you have mild or severe, it's not a competition. And so I will continue to support those who need it. If someone asks a question and I do not have the answer, I will try and find it. I do get upset and anxious a lot. It's hard to move past it most days. I know everyone has their bad days, gastroparesis is debilitating. It causes me a lot of pain and it causes me to vomit. I can tell you that when I have not been able to eat in a few days, or if I am in a lot of pain, it is really hard for me to keep my head clear. I usually have to take a break from the computer I order to get into a better headspace. People make mistakes – we all do. We are all human and we do have the tendency to react out of anger or fear. We say things that we later regret because in the heat of the moment, with being sick on top of it, we respond rashly to simple things that would not warrant that kind of reaction. Once you say something like that on the Internet, it is forever. My suggestion would be to write out all of your feelings in an email and send it to yourself. Then, go do something else for a bit, and see if that helps you from making the mistake of something you would completely regret saying. Furthermore, I do not believe in publicly basting others on Facebook either. If you have an issue with someone, please leave it out of the groups. Instead, contact them directly and try to address it. If that does not work, block them. Just know that you tried your best. I wrote this in one of the groups a while back, and I still mean it: Our community should be a welcoming and place for all to come and share their concerns, joys, heartaches, questions, and useful information. Support and helpful comments should be all we see. Our community should be a safe haven where people feel comfortable sharing their innermost concerns without the fear of negative repercussions and hurtful responses. We should be able to openly and honestly discuss anything in our lives that disturbs us, concerns us, keeps us from healing, fascinates us, or uplifts us. We should be able to be respectful of one another as well, even if we disagree. Minor disputes do not have to become wars. Please, I am begging you to be kind to one another and strengthen the bonds between us. Simply refuse to believe the gossip, rumors, and lies. 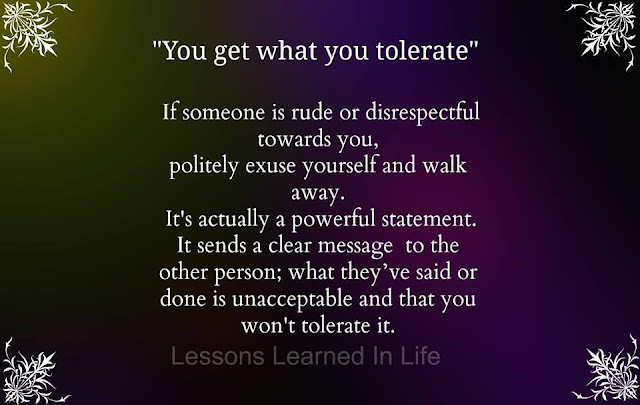 Refuse to perpetuate the drama and bad behavior. Ignore, scroll by, forgive, move on, and focus on what we all have in common. Focus on surviving and defeating this beast we call GP. Focus on fighting for our community, on supporting efforts to find better treatments and cures, on spreading awareness to those outside of our GP community who know nothing of our illness, and on offering support for our fellow GPers who so desperately need help. I am going to be offline more than usual over the next few days, or weeks, or whatever it takes for me to continue. I am keenly aware that I am sick. I am keenly aware that none of us is promised another day – so none of this drama matters to me. People’s opinions of me don’t matter to me. Doing what is right, demonstrating compassion and kindness, and helping others – that’s what matters to me. Forgiving others and accepting them with all their weaknesses and flaws – that’s what matters to me. I will not spend my days engaged in conflict or constantly trying to defend myself or justify my actions. I do not wish to devote endless hours to sifting through and sorting out insignificant claims and disputes. I want to help people, really help people – ALL people. I care for absolutely everyone in this community, and if you need help, regardless of who you are, I will assist you to the best of my ability. I am not perfect, and I don’t have all the solutions. I also don’t have as much time as I would like and cannot always do everything that everyone asks of me. But I love my fellow GPers, and I want to continue to do my very best to fight for our gastroparesis community. I hope you all want the same. We need each other.